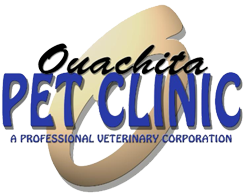 Here at Ouachita Pet Clinic, our veterinarian and staff will educate you so that you can make the best choices about your pet’s health and well-being. We know that happy pets are healthy pets, and when they’re happy, you’re happy. We value all of our patients and clients! To us, you and your pets are like family, and we will always make every effort to keep a small clinic and family-like atmosphere. We truly care about your pets, and it is important to us that we meet you and your pet’s specific needs. Our services are all designed to optimize your pet’s health and well-being, giving you peace of mind. Our facility is equipped with new state of the art anesthetic equipment, a new dentistry unit, an x-ray unit, and our lab is furnished with quality analyzers so that we can run most panels in-house, this helps our doctors diagnose and treat most problems as quick as possible. We also maintain excellent relationships with nearby specialists, should your pet need a referral for specialized care. You will benefit from a team of professionals who know you & your pet personally and will go above and beyond to make both of you smile.